As part of a time-honoured tradition, Rector Ralf Hemmingsen will today welcome new University of Copenhagen students. This year, some 350 fewer students will be taking part in the outdoor Matriculation Ceremony than did last year. Rector Ralf Hemmingsen will shake hands with new students attending the University of Copenhagen, a time-honoured tradition at the annual Matriculation Ceremony. After an extended period in which the number of students being admitted the University of Copenhagen grew annually, admission this year fell. The smaller incoming class size is a part of the national government’s efforts to promote a diverse post-secondary education landscape. “You’ve worked hard to get into university, and this year the bar has been set even higher. We have moved it up because we’ve understood that there is a connection between the size of an incoming class, the quality of education we can offer you and your ability to find a job later after you graduate,” Rector Ralf Hemmingsen told the students in his address. Rector Hemmingsen also urged the new students to remain focused on their studies, and to keep in mind that the ultimate goal of their education was to prepare them for a life after university. “Reflection is at the heart of a university education, but that shouldn’t prevent you from finishing on time. We’re not asking you to rush through – rushing is almost antithetical to university thinking. And imagine what a loss it would be if finishing as fast as possible meant that you didn’t get the chance to study abroad or get practical experience,” Rector Hemmingsen said. The Matriculation Ceremony is the University of Copenhagen’s annual welcome to its new students. This year, 7,616 undergraduates, 1,800 foreign students and 1,500 transfer students beginning work on a Master’s degree have been invited. The practice of having all students shake hands with the Rector is rooted in university history and symbolises their promise to abide by the school’s rules. This year, Rector Hemmingsen will be joined by Prorector for Education Lykke Friis. During the ceremony, students will enter into Ceremonial Hall from Frue Plads. From there they will progress out to the courtyard, where they will shake hands with the Rector, before returning back to Frue Plads. A reception will be held in conjunction with the Matriculation Ceremony. Activities will conclude at 5pm. 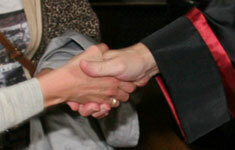 Did you miss Rector's speech or the traditional handshake? See videos from the 2014 Matriculation Ceremony below.